Welcome back to school! We hope you had a wonderful Christmas and enjoyed some time with your families. We are straight back to getting stuck in and have kicked off our new topic ‘Invaders’. 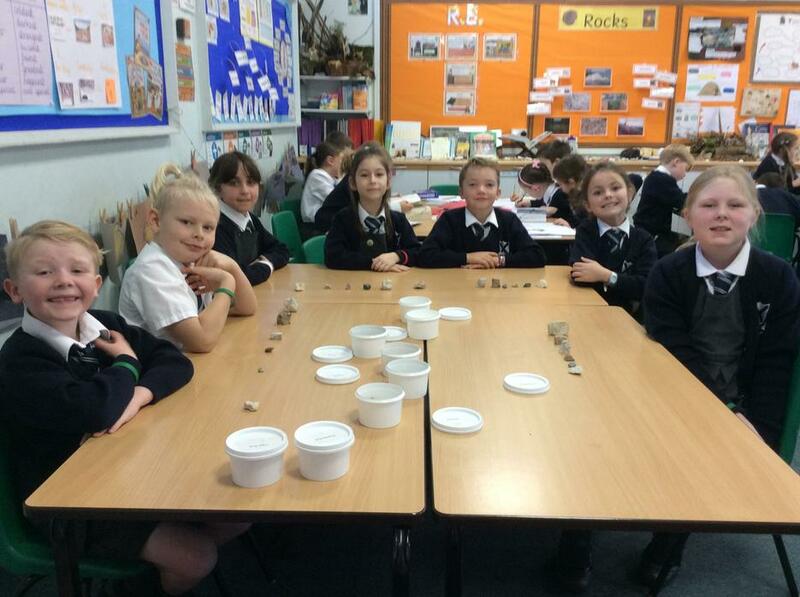 We have had a lot of fun learning about the Romans, and are excited to learn lots more about them over the next term. Have a look at our curriculum poster for some more information. 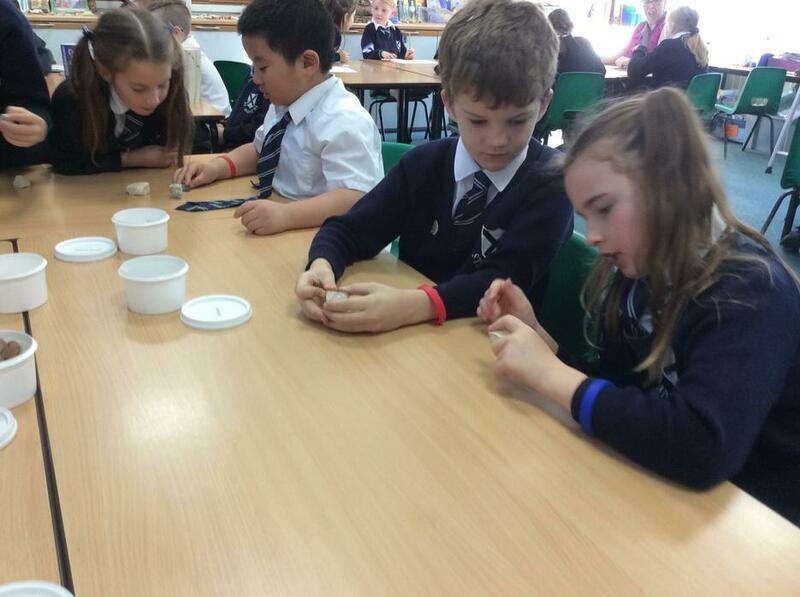 We have had a wonderful science week and have been getting stuck in to lots of practical learning. We have planted seeds, studied the gardens, observed local wildlife and learnt how to care for and nurture plants. Sadly the weather scuppered our plans for creating shadow art, but stay tuned for photos as soon as we get a sunny day! Can you recognise the book characters? Year 3 enjoyed sharing books with older Year 5 children. It was wonderful to have the time to share our favourite books with one another and to listen to different adults telling their favourite tales. In class, we listened to ‘Chandra’s Magic Lamp’. The story didn’t turn out quite as we predicted; the lamp was actually solar powered! We were able to collect a lot of interesting clues about life in Nepal throughout the story. 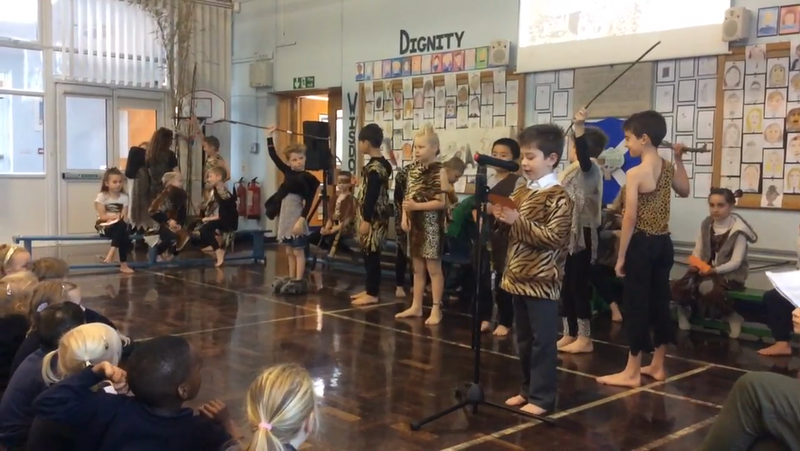 A super Roman assembly focussing on our unit ‘Escape from Pompeii’. Some incredible talent in the Roman theatre, including acting, dancing, riddle telling and acrobatics! We enjoyed different breads, cheeses, olives, grapes, tuna and lots more. A delicious Roman feast! We were busy starting to make our Roman shields and creating mosaic pictures. We paused for some Roman refreshments! The grape juice was very popular. Y3 gave the adults a difficult job to choose the finalists of the Internet Safety homework. An amazing standard, with entries from poems to 3D creations. A huge ‘Well done’ to Perez, Noah and Reuben who were our class finalists. They spoke so confidently about their homework in the assembly. We discussed some challenging scenarios in our talk trios. See if you can challenge your parents with a ‘What would you do if....? Share some of our very wise ideas. Remember: Think before you click and if in doubt, TELL! Congratulations to Mya, who won the courtesy cup and was awarded Star of the Week. What a fantastic achievement! Congratulations to our Star of the Week and courtesy cup winners this week! Congratulations to our Celebration Assembly winners today! Year 3 busting out some moves during our Christmas dance party! We had a wonderful time dancing and celebrating together. What a stunning performance of 'Joseph and his Technicolour Dreamcoat'! 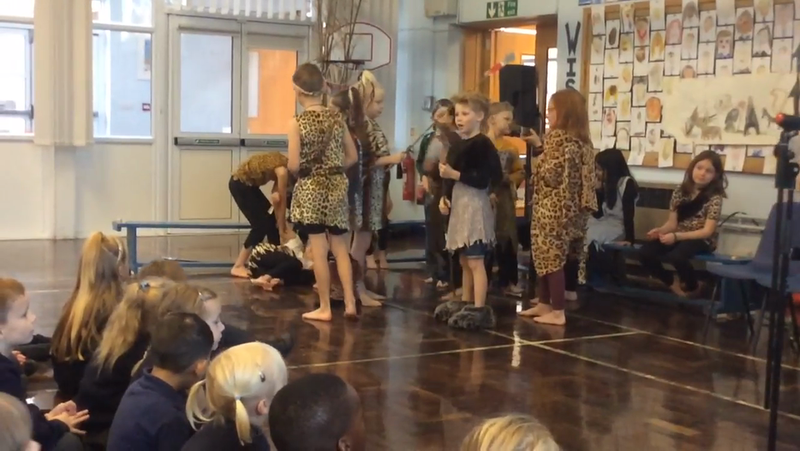 We are so proud of the teamwork in Year 3 and the dedication everyone showed in learning their words, songs, dances and acting out their characters so brilliantly. It has been so much fun putting this together. A special 'well done' to everyone who bravely sang a solo. What an achievement! everyone's costumes. We also liked the Wizard of Oz , We will rock you and all the other class shows. I loved doing my solo (Reuben). 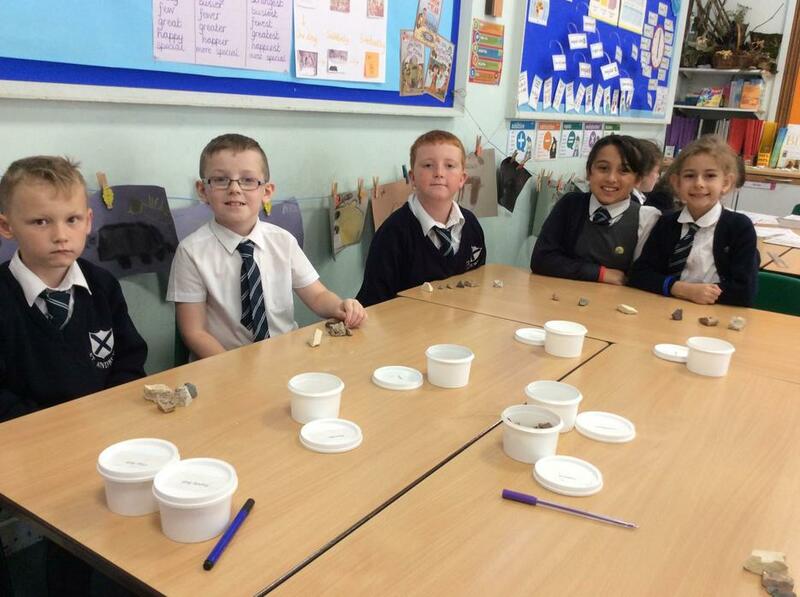 We loved being archaeologists and artists! Feeling excited, we crept towards the mouth of the cave. 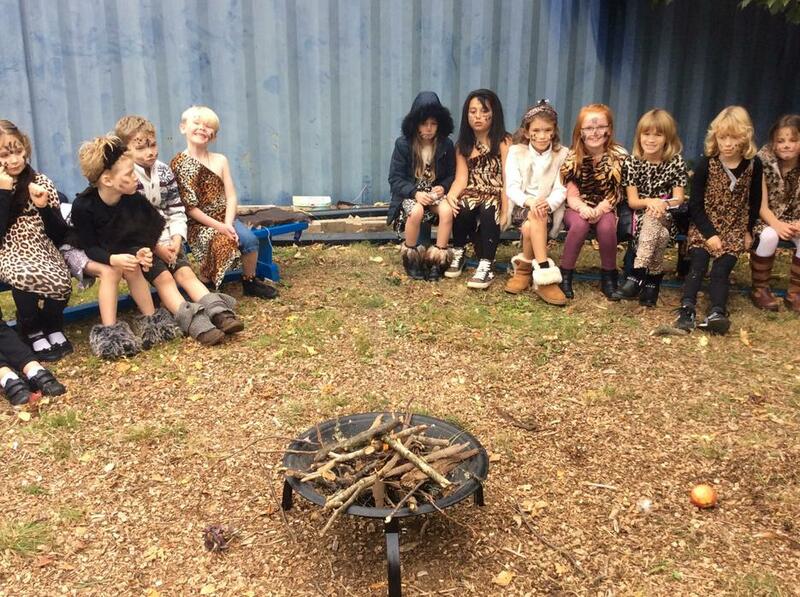 It looks a lot different from how it would have appeared in Stone Age times! ...and even stopped at the ‘Wishing Stone’! The light from the shell lamps shone bright. When the light was extinguished, we experienced the darkest of darks! We couldn’t even see our own hands waving in front of our faces! Then, feeling refreshed, we headed back to the cave to show off our artistic skills. At the end of the trip, we set off back to school with our treasured gems from the dig, our wonderful cave drawings, lots of new learning and a heart full of happy memories! Well done Year 3. 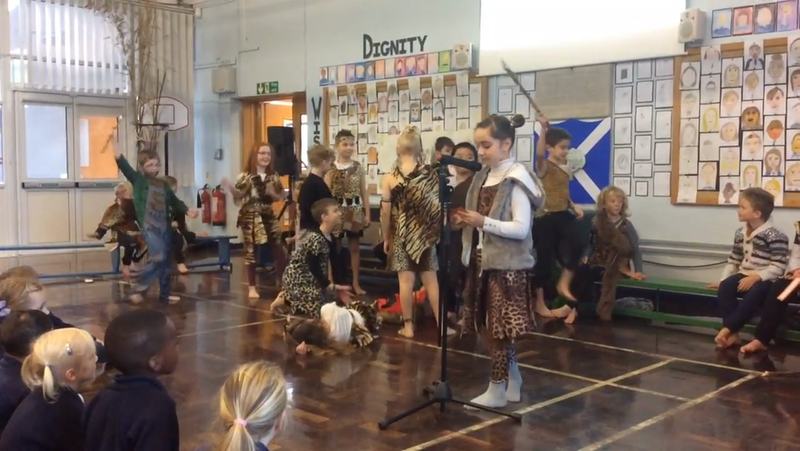 Your ‘Back to the Stone Age’ assembly was simply stunning! What a team! 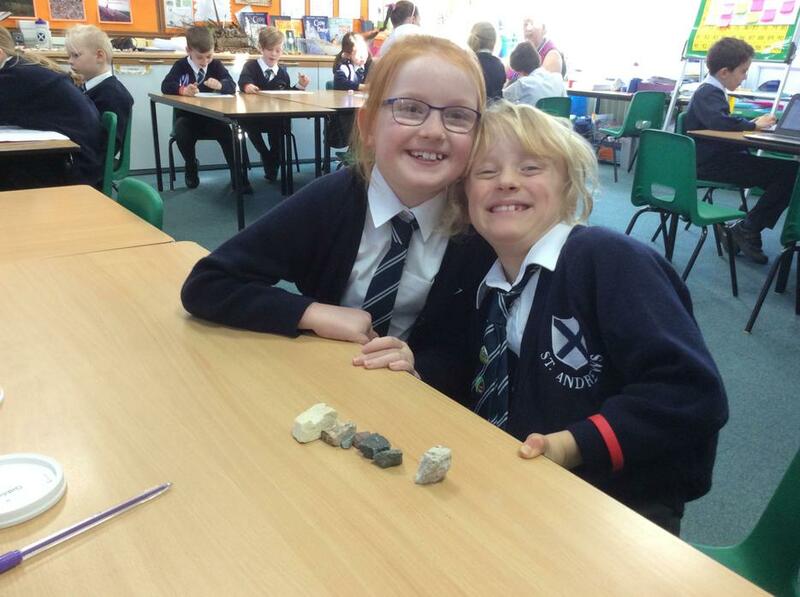 As part of our learning in science we have been learning all about different types of rocks. 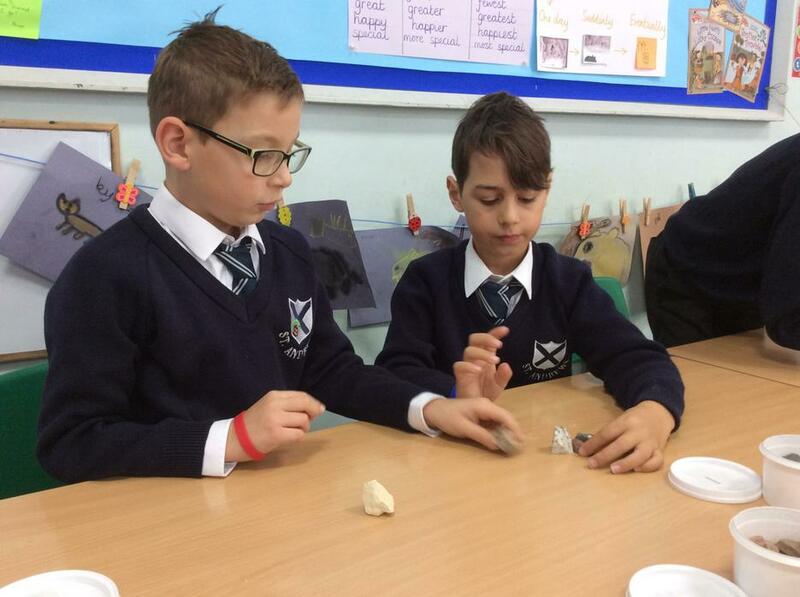 The children have carefully studied rock samples and observed the properties of each. 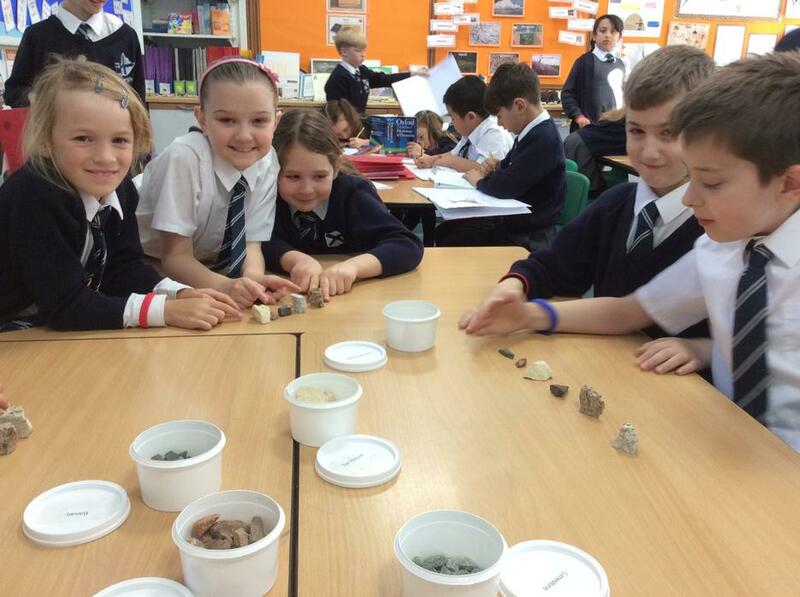 We enjoyed investigating lots of rocks today! Congratulations to our celebration assembly certificate winners! Making paint using foraged berries, grass, mud, charcoal etc. 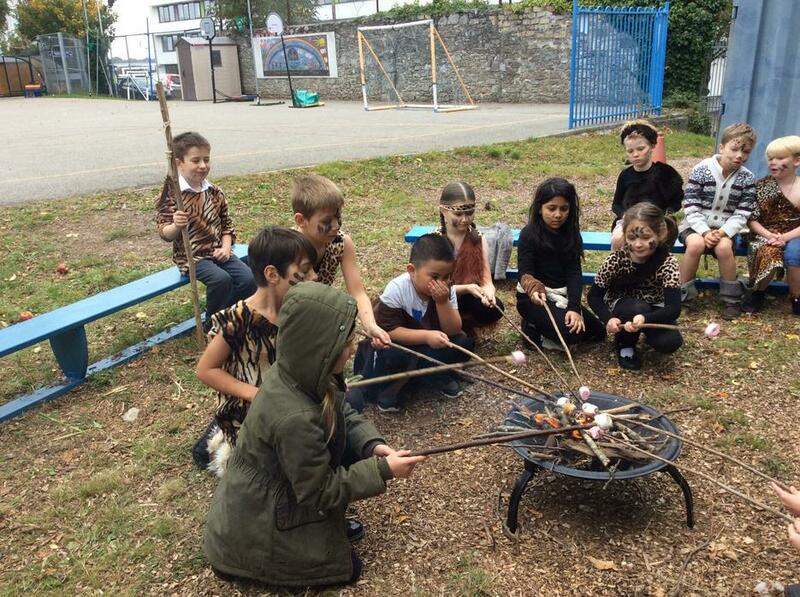 Lighting a fire and toasting marshmallows to end a perfect day! 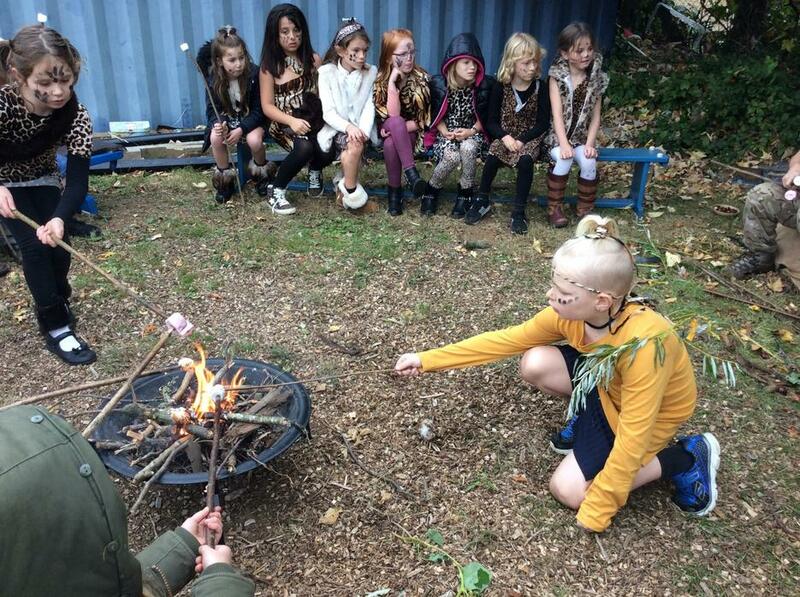 A huge ‘thank you’ to Debbie from WildAboutWoods for making our outdoor experience so much fun. Violent volcanoes are erupting in Year 3! 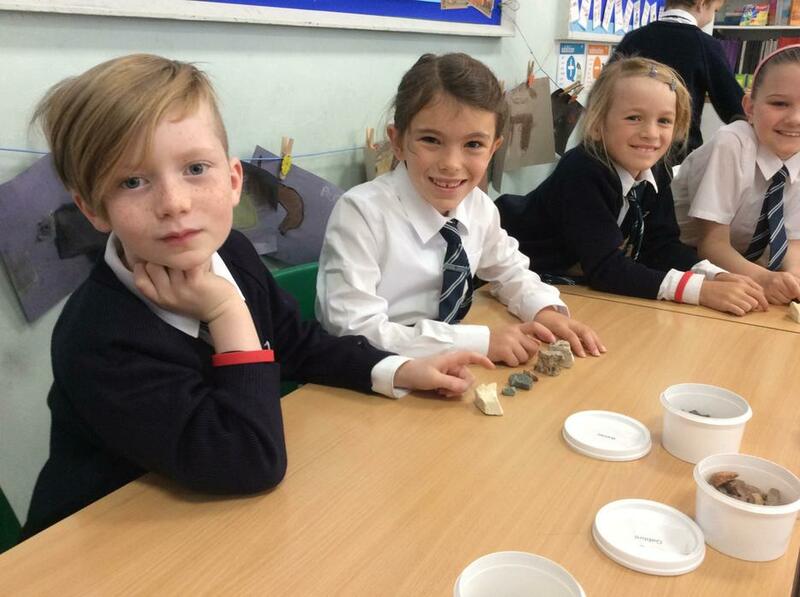 In science we have been learning all about the Earths structure and how volcanoes are formed. The children have been enjoying this topic immensely, especially when we created our own volcanic reaction in class! Please see the link below for how you could recreate this at home. Perhaps you could take a photo to share with us if you choose to give it a go. It is lovely to see everyone back from the summer break refreshed and ready to learn. We have really enjoyed sharing our news and adventures as we get back into the rhythm of school life. 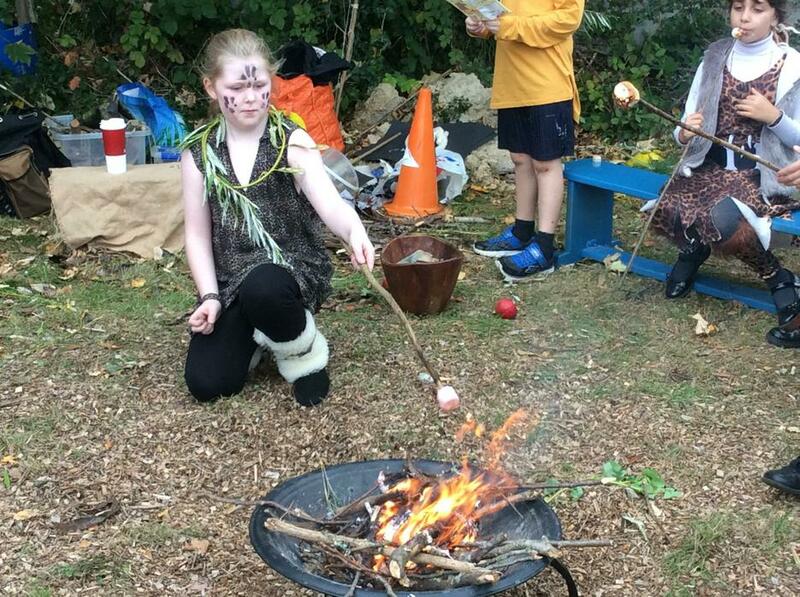 There is so much to look forward this term, from Stone Age themed days to a whole school Christmas performance! Our fantastic range of clubs start next week (17th September) and end the week beginning 28th November. Please bring in your yellow slips for a chance to join in! We already share ideas brilliantly with talk partners! 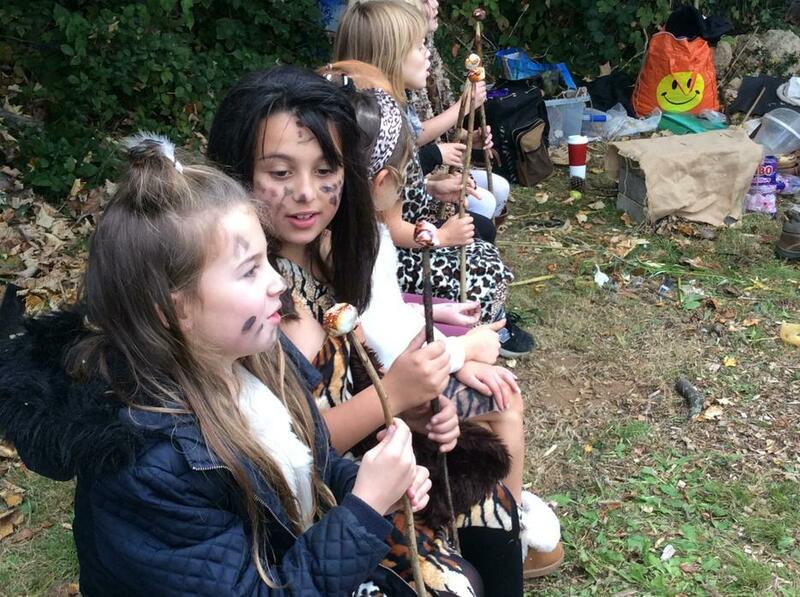 It was lovely to see so many children speaking so confidently about their summer holidays. Some wonderful homework has been completed. Some are on display in the corridor. Come and see the quality! Well done, Year 3! We have begun to travel, balance and jump with control. Today we perfected our crab walks, bunny hops, caterpillar walks and hummingbird movements. We learned the five basic jumps and started to link together a jumping sequence (tucked, star and half twist!) Mrs Dean is so impressed with how carefully we move and hold our shapes!